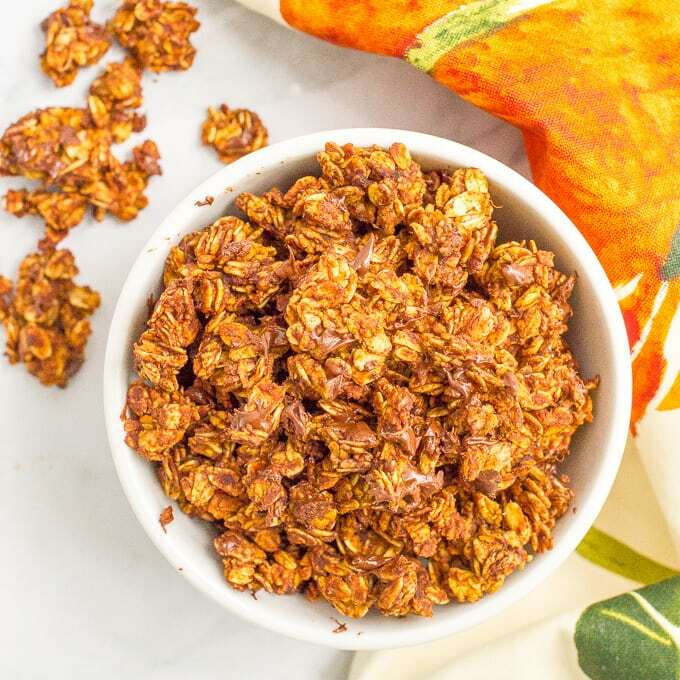 Chocolate pumpkin granola is an easy recipe you can make ahead and have on hand for breakfast or snacking. It’s naturally gluten-free and vegan. Yay for Friday! I’ve been battling a cold for almost a week now and I’m about ready to be D.O.N.E. Today though, let’s talk some breakfast deliciousness. 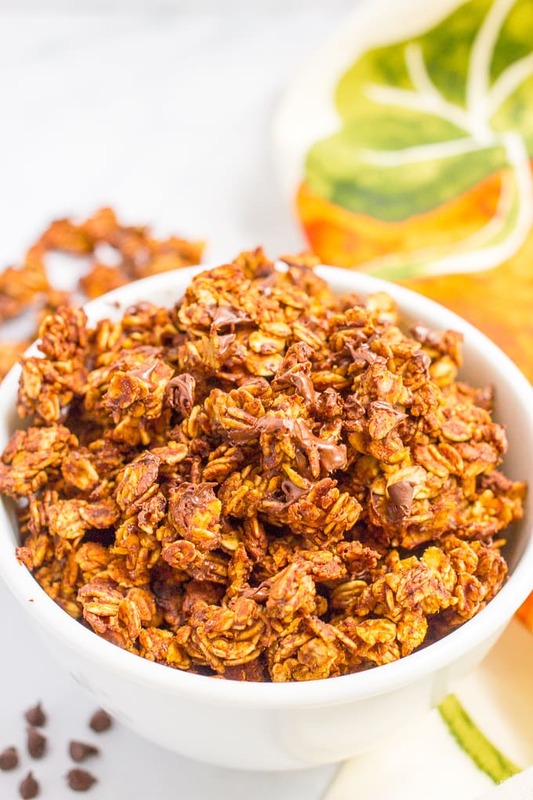 I’ve been making this chocolate pumpkin granola on a weekly basis for over a month now. It’s so addictive and just the way I want to start the day. It’s also one of those foods, once I have it in the pantry, and I know it’s there, it calls to me. And I cannot resist the call. I grab a handful here and there and then I finally give in and just fill up a bowl. So you know my love for chocolate + pumpkin, right? It’s well documented. 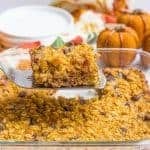 I recently shared my pumpkin baked oatmeal with chocolate chips — another breakfast favorite — and I’ve also got my pumpkin chocolate chip mini muffins, chocolate pumpkin cake, and just last week it was my banana pumpkin chocolate chip cake. Today I continue that trend with some homemade granola. 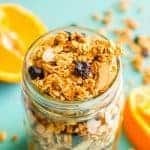 I love my easy 5-ingredient granola but I’m always changing things up and trying different flavors. We’re a granola loving family through and through. Wanna know the sorta terrible reason I love giving my kids granola for an afternoon snack? It takes them FOREVER to eat it. It’s all those small crunchy bites to pick up and chew. And all that time they sit there crunching, quietly plodding their way through a little snack container of granola? I can finish up work for my day job. Catch up on a couple of emails. Take a few minutes to prep something for dinner. Clean up the kitchen. Anything. Peace and quiet (minus the chewing). For me, I usually eat it with some plain Greek yogurt for a morning parfait of sorts. 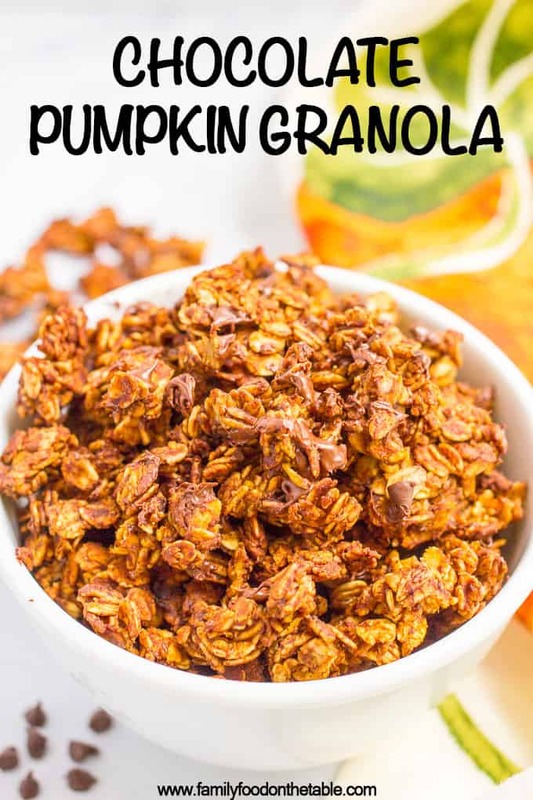 But this chocolate pumpkin granola? I eat it on its own. By itself. Nothing with it. I don’t want anything interfering with this granola. But you feel free to add on, mix in, doctor up and fix it however you like! I’ve made this with maple syrup and with honey. I prefer the maple syrup — it goes so well with pumpkin — but you can use honey if that’s all you have on hand. I like to add the mini chocolate chips about 5 minutes after the granola has come out of the oven, while it’s cooling on the sheet pan. 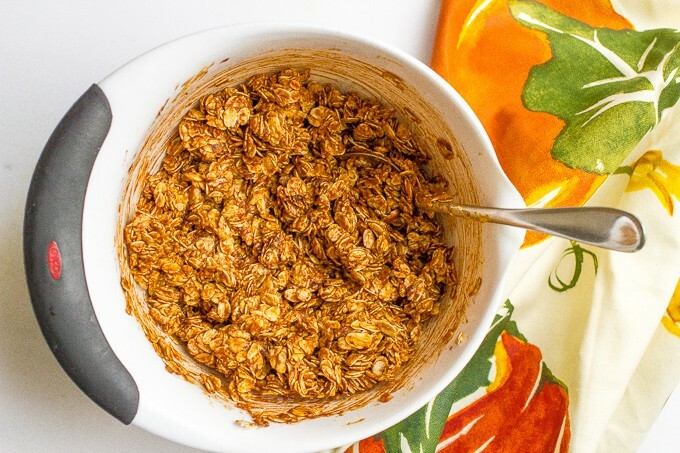 This allows the chocolate chips to slowly melt and incorporate into the granola. If you wait until the granola is mostly cooled, the chocolate chips will stay intact but will sink to the bottom and be hard to scoop. That’s no fun. Be sure to check all of your ingredients carefully if you need this to be gluten free. 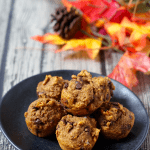 This recipe is vegan if you use a vegan chocolate chip substitute. I use canola oil in this recipe because it helps add a bit of richness. You can omit it but the granola will be a little less well-rounded. You also can substitute coconut oil or melted butter if you prefer. An easy recipe to make ahead for breakfast or snacking. Gluten-free and vegan. Preheat oven to 315. Yes, 315. Line a baking sheet with parchment paper and set aside. 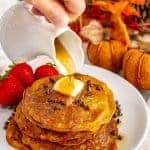 In a medium bowl, combine maple syrup, pumpkin puree, canola oil and vanilla. Add oats, cocoa powder, pumpkin pie spice, cinnamon and salt and stir to get everything well coated. 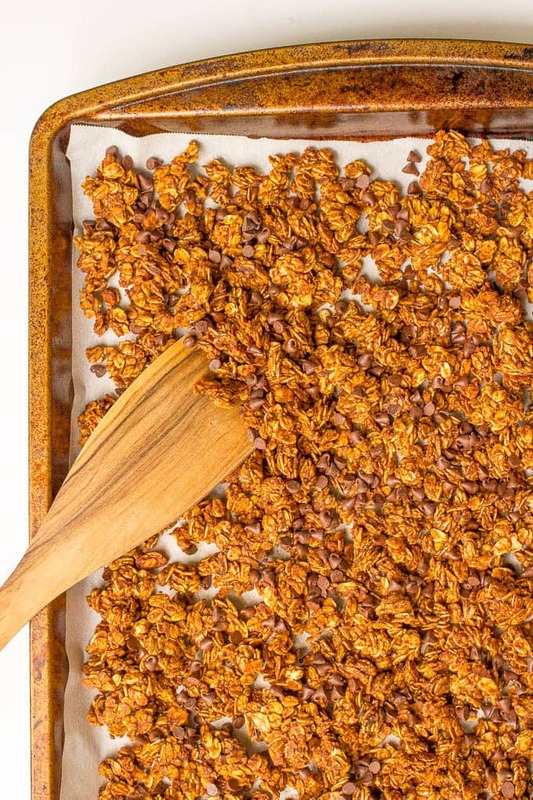 Spread granola onto parchment-paper lined baking sheet and smooth out into an even layer. Bake at 315 for 40 minutes, turning halfway through to flip over the granola pieces. Remove from oven and let cool on baking sheet for 5 minutes. Add mini chocolate chips and stir using a spatula to help them get combined and melted. 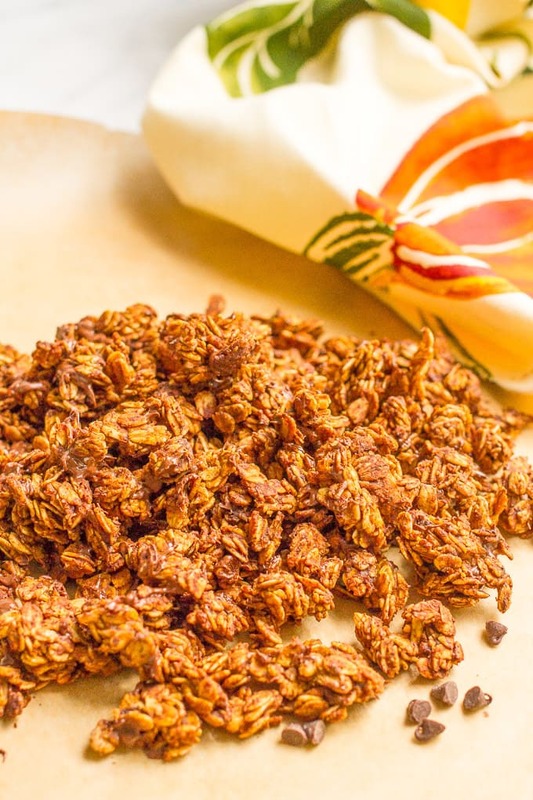 Let the granola cool completely on the baking sheet before transferring to a jar or plastic container. Granola will keep at room temperature for up to a week. I’ve made this with maple syrup and with honey. I prefer the maple syrup, but you can use honey if that’s all you have on hand. Be sure to check your ingredients carefully if you need this to be gluten free. Thanks Tara! 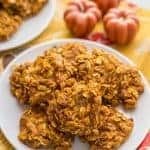 It’s a fall favorite here! Ah! 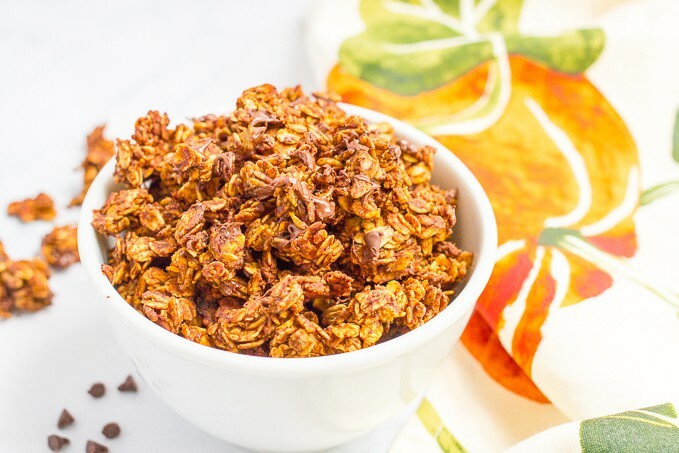 All those classic pumpkin spice/pie granola recipes have nothing on one with CHOCOLATE! What is it about those first Fall colds – they are the worst – I’ve been battling one too – I sure hope you recover completely in time for this weekend! Hope you feel better!! And 100% agree on chocolate + pumpkin – LOVE it!! This looks delicious! Love the chocolate + Pumpkin combo! Thanks Kelli! One of my favorites!! I love granola in general, but chocolate and pumpkin?? Granola mic drop, Kathryn – yay YOU! I love this recipe! It’s my go-to when I need a quick breakfast or a snack. 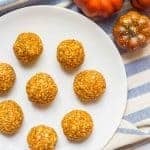 I love that it’s sugar-free and full of vitamins with the pumpkin puree! The only problem is it seems I go through it very quickly! Thank you for posting!!! Hi Sarah! Yes, I think cutting out the chocolate chips and adding flaxseed would be a great addition to boost the fiber and healthfulness! Also, I revised the recipe card so the amounts shown in the nutrition label would be per 1/4 cup serving, in case that’s helpful for you. I’d love to hear if you try it! Forgot to update you. I ended up adding some chocolate chips to mine, but forgot to add the flaxseed. Oh well. Very delicious! I liked using it instead of cereal.